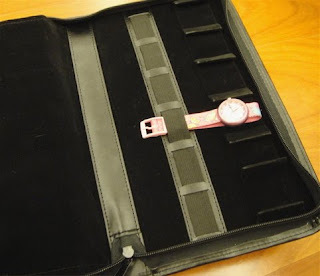 I recently got a watch storage pouch from the watch street here in Taiwan. To digress a bit, Taiwan is unique in that there are streets or roads that cater for specific needs of the people. For example, there is a camera street, a book street, a cloth street and my recent find, a watch street. I will bring more on the watch street soon. 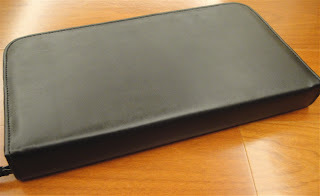 The watch box measures 30 cm by 16.5 cm. It is 3.7 cm thick at the 'spine' of the box. 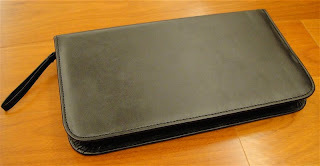 It is matte black and is made of synthetic leather. 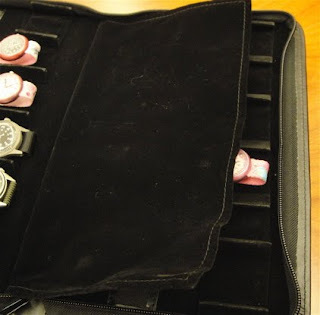 It opens like a book and can store 12 watches, 6 on each side. The outer cover is slightly padded. The box is 'locked' via a zipper. The box/ pouch cost USD 13. It is made in Hong Kong. The overall finish and quality of the pouch is not bad. For USD 13, I can't complain too much. 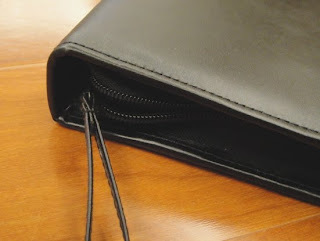 The zipper for example, is unsigned. The stitching is good and pretty consistent over the pouch. 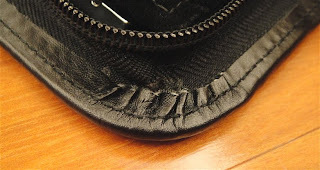 The excess 'leather' is glued to the zipper and there does not seem to be any overrun of the glue. 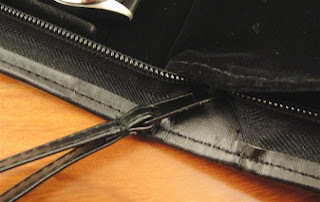 The zipper itself is smooth to use and it is assisted by a strip of 'leather'. 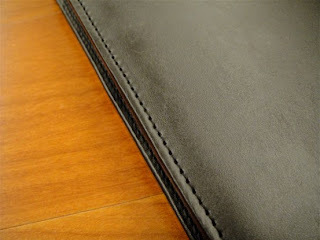 The 'leather' strip is looped over the zipper and measures 9.8 cm. It does help in using the zipper. 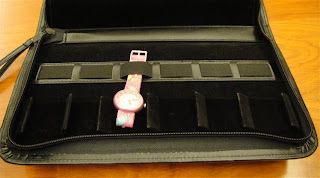 The watches are held in the pouch by elastic bands. The bands measures 3.7 cm long on the outer edge of the strip and 3.5 cm in the inner 4. The band is 2 cm wide. 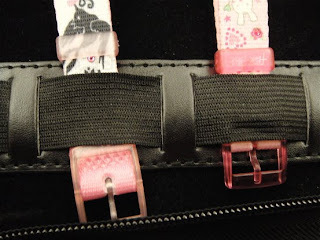 The inner/ center 4 bands will hold straps measuring 22 mm comfortably while the outer 2 will hold straps up to 24 mm. 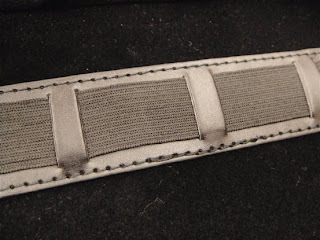 The bands itself is held to the pouch with a strip made of the same material as the outer case. The watch head itself is protected from each other by a shoulder. This shoulder measures 4 cm long and 13 mm in height. The width of the shoulders is also 42 mm. As such, it can takes watches up to 42 mm with crown. As for the length of the watch (folded) it can take up to a maximum of 125 mm, measured from the bottom lug to the top of the buckle. The shoulders are 2 mm thick. I believe that the pouch provides adequate protection. 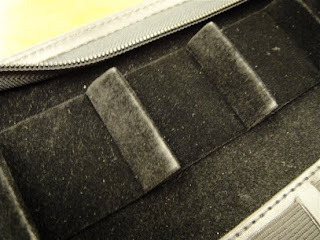 The entire inside of the pouch is lined with velvet. The protective shoulders are also lined with velvet. 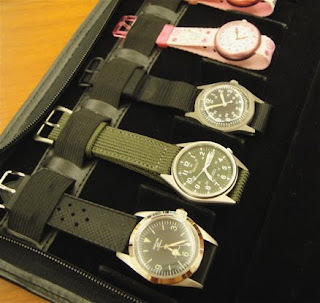 There is a thin velvet tongue that protects the watches from each other. This tongue is off-set along the spine of the pouch. Remember the pouch opens like a book. The tongue itself, like stated earlier, is rather thin. I wish it was a bit thicker. 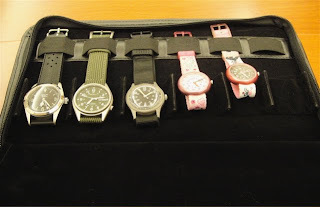 However, since the watches itself is arranged such that the watch heads on both side of the pouch would not hit each other, it does not really matter (the head on one side is towards the spine and the head on the other is towards the zipper). Note the watch head towards the zipper. The tongue is attached on the other side of the spine. Note the watch head towards the central spine. Overall, for USD 13, I cannot fault the watch pouch. 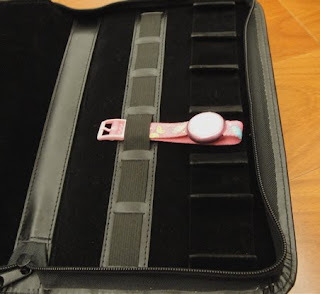 I would like it if it could store larger watches, but it does serve my purpose in storing my smaller size watches and my children's Flik Flak. I am happy with it.